"We've forfeited the rights to our own tragedies. As the carnage in Mumbai raged on, day after horrible day, our 24-hour news channels informed us that we were watching "India's 9/11". Like actors in a Bollywood rip-off of an old Hollywood film, we're expected to play our parts and say our lines, even though we know it's all been said and done before... But November isn't September, 2008 isn't 2001, Pakistan isn't Afghanistan and India isn't America. So perhaps we should reclaim our tragedy and pick through the debris with our own brains and our own broken hearts so that we can arrive at our own conclusions." Arundhati Roy compares Hafiz Saeed of Lahore, Pakistan, with Babu Bajrangi of Ahmedabad, India, who sees himself as a democrat, not a terrorist. He was one of the major lynchpins of the 2002 Gujarat genocide and has said (on camera): "We didn't spare a single Muslim shop, we set everything on fire … we hacked, burned, set on fire … we believe in setting them on fire because these bastards don't want to be cremated, they're afraid of it … I have just one last wish … let me be sentenced to death … I don't care if I'm hanged ... just give me two days before my hanging and I will go and have a field day in Juhapura where seven or eight lakhs [seven or eight hundred thousand] of these people stay ... I will finish them off … let a few more of them die ... at least 25,000 to 50,000 should die." Ms. Roy quotes the Hindu Right Wing RSS founder MS Golwalkar who said in 1944, "To keep up the purity of its race and culture, Germany shocked the world by her purging the country of the Semitic races – the Jews. Race pride at its highest has been manifested here ... a good lesson for us in Hindustan to learn and profit by." As the chauvinistic rhetoric dominates the airwaves, television screens and newspapers on both sides of India-Pakistan divide since Mumbai terrorist attacks, there are also a few voices of reason urging each side to look within their own societies for answers to the causes of Mumbai and terrorism in both nations. Professor Pervez Hoodbhoy of Pakistan and Author Arundhati Roy of India have both added their unconventional touch to the ongoing debate. The frank talk by these two peace activists should serve as a dose of reality for both nations. Here's an OpEd by Roy in London's Guardian newspaper on Dec 13, 2008. But where would Side A accommodate the sayings of Babu Bajrangi of Ahmedabad, India, who sees himself as a democrat, not a terrorist? He was one of the major lynchpins of the 2002 Gujarat genocide and has said (on camera): "We didn't spare a single Muslim shop, we set everything on fire … we hacked, burned, set on fire … we believe in setting them on fire because these bastards don't want to be cremated, they're afraid of it … I have just one last wish … let me be sentenced to death … I don't care if I'm hanged ... just give me two days before my hanging and I will go and have a field day in Juhapura where seven or eight lakhs [seven or eight hundred thousand] of these people stay ... I will finish them off … let a few more of them die ... at least 25,000 to 50,000 should die." Homeland Security has cost the US government billions of dollars. Few countries, certainly not India, can afford that sort of price tag. But even if we could, the fact is that this vast homeland of ours cannot be secured or policed in the way the United States has been. It's not that kind of homeland. We have a hostile nuclear weapons state that is slowly spinning out of control as a neighbor, we have a military occupation in Kashmir and a shamefully persecuted, impoverished minority of more than 150 million Muslims who are being targeted as a community and pushed to the wall, whose young see no justice on the horizon, and who, were they to totally lose hope and radicalize, end up as a threat not just to India, but to the whole world. If ten men can hold off the NSG commandos, and the police for three days, and if it takes half a million soldiers to hold down the Kashmir valley, do the math. What kind of Homeland Security can secure India? The only way to contain (it would be naïve to say end) terrorism is to look at the monster in the mirror. We're standing at a fork in the road. One sign says Justice, the other Civil War. There's no third sign and there's no going back. Choose. It is a well known fact that Arundhati Roy is an utter fool. After writing ONE book, which miraculously won the booker, she has been using her new found celebrity status to seek attention from wherever she can. I am surprised that it took her three weeks to churn out this rubbish. Usually she is much quicker. Arundathi is being self-critical. Unfortunately, she is being being quoted by the big bald bigot - the devil. Indian society is a liberal society, not like yours led by lawless, godless, mindless mullahs. You say "Indian society is a liberal society, not like yours led by lawless, godless, mindless mullahs." Apparently, you are no liberal and find comfort in criticizing the mullahs while ignoring your brand of "lawless, godless, mindless" clerics who are much more violent if you look at the death toll from continuing Hindu violence and poverty in India. We are suffering the consequences of proximity - We have a lawless, godless & mindless society next door. Your society spawns Jihad & your wild gun-toting progeny are spilling out into our home. Hindu violence ha ha! Another excellent post by her though she did not write much about Pakistan. Arundathi Roy says president Bush is unpopular and USA is loosing the war. How popular is she in India?. Her writing is full of hatred, animosity, and jealousy. She should realize that there are many Indians who have won Booker and lead a dignified, honest life. Arundathi needs to be a target for such vulgur voilence witnessed in Mumbai and then she will shut up. Writing rubbish with twisted logic makes her truly disgusting. Every police officer who is anti-hindu is a hero and every police officer who is anti-minority is a villain. Ofcouse it is all her twisted logic. She can't have it both ways. She is lucky that she lives in India and is treated with dignity, inspite of all the humiliations she heaps on India. Why can't she migrate to pakistan. Please!!. In Greek mythology, Cassandra is cursed. She always speaks the truth, but she is not believed. Andy Grove, the successful former CEO of Intel where I worked for many years, talks about the value of Cassandras in his book titled "Only the Paranoid Survive." I concur with Andy and I believe both India and Pakistan need more Cassandras like Arundhati Roy to loudly speak the truth to us in South Asia. The person closest to being a Cassandra in Pakistan is Dr. Pervez Hoodbhoy, the Chairman of the Physics Dept at Islamabad's Quaid-e-Azam University. 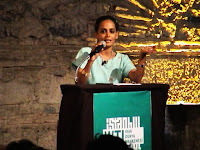 You wrote: "I believe both India and Pakistan need more Cassandras like Arundhati Roy to loudly speak the truth to us in South Asia." Arundhati Roy speaking the truth? hmmm IMO, that might be stretching it too far........like everyone else, she has opinions, belief's and causes. What separates her, is her ability to convey those in a powerful commentary. The truth is colored by our individual biases and prejudices. But, you are free to believe her version as the truth. A person who writes about the massacre of innocent lives and calls it creulty and unjust is called an idiot,disgusting and traitor but people who carried out the murders are held in high esteem and called the leaders in India........wow......Shining India eh?? Dear Indian Hairy Puttar (the opposite of bald bigot I believe)...Like a said a long time ago, the more you try to hide the more you reveal yourselves..the so called democratic, liberal, educated, fanatics....you are just a bunch of morons... I am glad that I have a long line of friends from the sub-continent who warned me about people like you long before you became so vocal....Arundhati Roy is matchless and she simply rocks!!! The fight of the common man and underprivileged in India against exploitation, against corruption, against hand to mouth existance is India’s fight and India’s alone. It is NOT the fight of so called Islamist’s from accross the border trained by ISI. A. Roy has been muddled and mixed up in this entire article. If her article were written in any other context, it would have made some sense. Coming in the wake of Mumbai attacks, it shows a lack of clarity in her thoughts. North Indians bigots will never like and accept a south Indian queen like Arundhati[PERIOD]. How many of you have ever accepted the responsibility of anything....next time your son coughs, blame Islam, muslims, mullahs, and may be Ms. Roy. Arundhati Roy is seeming to support jihad for Kashmir but she is not even saying that. If you read carefully she is still criticizing Pakistan and using the word "terrorist" which she confused by talking about side A and side B back and forth. So she is still only a confused Indian liberal and nothing more. Afterall she is a Indian Christian (which means half Hindu in belief). Even Indian Muslims have Hindu outlook. Most Indian muslims are not supporting violence, so it proves my point about whole of India being a kind of Hindu country. glad to read this article by a. roy. As also some comments by some dimwits. US media have been widely and repeatedly reporting on the awful March 11 murder of three small Israeli children and their parents. While no one yet knows who committed this act, reports presume that the murderers were Palestinian, and for this reason the incident is receiving major attention. Various heads of state, including President Obama, have condemned it. Maharashtra chief minister Prithviraj Chavan's contentious statement that the Congress should have retained the home department has sparked off a row in political circles, particularly in the NCP, which holds the portfolio. State NCP president Madhukar Pichad and home minister R R Patil reacted sharply to the statement, calling it "unfortunate". Chavan also said Mumbai was ill-equipped to tackle terror. He told TOI on Friday that for over 15 minutes after the bomb blasts, he was unable to get in touch with Mumbai police commissioner Arup Patnaik or any senior police officer or bureaucrat. "There was a complete jam in the mobile network," he said. "Even the wireless network was not functioning, since it works only within a limited radius. I have taken it up with the Centre. I am sure we will soon have a VHF dedicated network exclusively for the state government. We have decided to provide satellite phones to key IPS officials and bureaucrats." What did he have to say about the blasts showing up the government's lack of preparedness? Chavan admitted that owing to rampant red-tapism and procedural wrangles, his government was not able to install around 5,000 CCTV cameras and was unable to procure sensitive weapons, bullet-proof jackets and security equipment. "We will install the CCTVs across the metropolis in a time-bound period," he said. "As far as the procurement of weapons and equipment goes, I have personally spoken to Prime Minister Manmohan Singh and home minister P Chidambaram on Thursday." Chavan reiterated that there were no intelligence inputs from the Centre and that the Mumbai police and crime branch had received no information on the possibility of a terror strike. "We had no information," he said. "But in view of the serial bomb blasts, we will redraft our strategy for gathering intelligence." Another thing he felt needed to be redrafted was protocol norms for visitors to hospitals during crises. "My senior cabinet colleagues had suggested some regulations so that visits to hospitals could be restricted. In the last two days, we found that hundreds of persons visited the hospitals where the blast victims were; as a result, the doctors were unable to concentrate on their work. We will soon come out with new norms," he said. And finally, what about the politicisation of the police force, which, after the blasts, has been at the receiving end of criticism for having corroded the police? "I am not aware of the policy in the past, but after I took over the reins on November 11 last year, the entire process has been transparent," Chavan said. "There is absolutely no politics in postings and transfers." A great deal of new evidence concerning the 26 November 2008 terrorist attacks in Bombay has emerged over the past year. This includes the book Who Killed Karkare: The Real Face of Terrorism in India by S.M.Mushrif, a former police officer with a distinguished record, who uses news reports during and just after the attacks to question the official story; the book To the Last Bullet by Vinita Kamte (the widow of Ashok Kamte) and Vinita Deshmukh; revelations concerning Hemant Karkare's bullet-proof jacket and post-mortem report; the David Coleman Headley trial; and the trial of Ajmal Kasab, Fahim Ansari and Sabauddin Shaikh. I do not include the Ram Pradhan Commission report on police responses to the attack, for reasons I will explain. It has been established that Headley was an agent of the US Drug Enforcement Administration, and his plea bargain leads us to conclude he was also a US intelligence agent: in other words, a spy. It is also known he was involved with the Lashkar-e-Taiba (LeT), and supplied information to them about targets attacked on 26/11. This consistent pattern of framing Muslims even for attacks in which the overwhelming majority of victims were Muslims, as in the case of the Samjhauta Express train blasts in 2007, could not have been sustained without the participation of the IB and police. Investigations into the Nanded blasts in 2006 revealed that bombs made by the RSS and Bajrang Dal had earlier been set off at mosques in Parbhani (2003), Jalna (2004), and Purna (2004), and were about to be used in another terrorist attack in Aurangabad when they went off prematurely. But half-hearted prosecutions allowed members of the network to get away. Ironically, local protests at the way the case was being mishandled led to its being transferred to the Central Bureau of Investigation (CBI), which further diluted the charges (Mushrif 153-67)! Initial investigations by the local police pointed to Hindutva groups as the perpetrators of the blasts at a Muslim festival in Malegaon in 2006 that killed over 30 and injured hundreds, yet again the police, the Maharashtra ATS (then headed by K.P.Raghuvanshi) who took over from the police, and the CBI who took over from the ATS charged Muslims against whom there was no evidence whatsoever (Khan 2010). It appeared that Hindutva terror groups could commit mass murder with impunity (Gatade 2008). If extremists are allowed to infiltrate India's state institutions unchecked, its constitution and secular character would eventually be destroyed. Hemant Karkare and Shahid Azmi lost their lives while trying to save India from this dire fate. We must ensure that they did not die in vain.